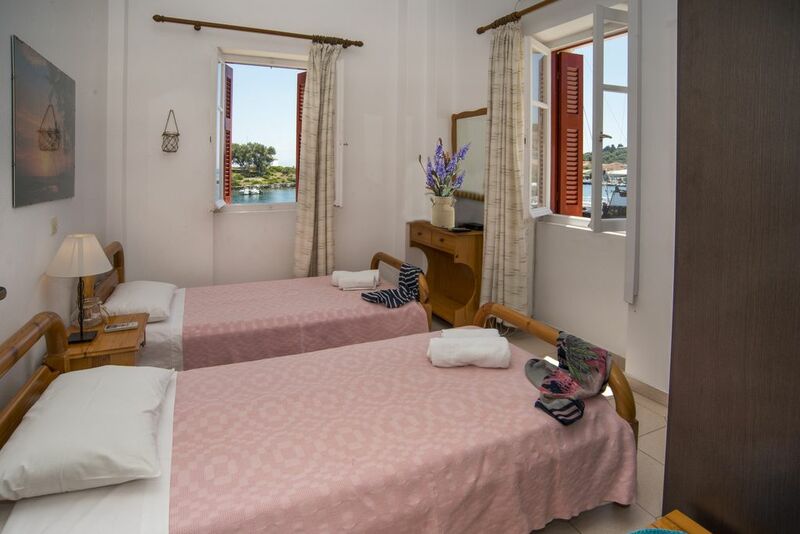 Elena apartment is a lovely property, which nestles in one of the most picturesque areas of Gaios Paxos right on the waterfront. Because of its location, it is overlooking St. Nicholas island at the entrance of Paxos port, all the way up to the Greek Mainland. Nice and cozy, ideal for travelers that wish to explore the picturesque heart of Gaios Town, this apartment is an excellent option. The apartment has easily reachable access to the main street village where one can find all the restaurants, shops and the boats that take you to one of the most beautiful beaches in Greece, Antipaxos. The closest beach called “Giannas”is only 350m away. The apartment consists of two bedrooms (one with a double bed and one with two twin beds), a shower room and a full fitted kitchen with stunning views over the bay. PERFECT LOCATIONWITH SEE VIEW !!! The location was superb. We wanted to catch the boat to Anti Paxos and we see it from our window! The rooms were very clean and quiet. It had everything we might need for a short stay. Well decorated, and plenty of room.. There was so much choice in the immediate vicinity for dining out that we couldn't get around them all. A supermarket less than 1 minute away and the boats in the marina a constant diversion. The Paxos locals were VERY friendly and we were made very welcome everywhere. Anny, the manager. Could not have been more helpful! Absolutely perfect for 1 week in Paxos! Everything was perfect during our stay! The flat is located on the waterfront and it is equiped with the basic. We enjoyed mostly the sunrises, as the sea views are perfect! The cleaner was very good and Anny, the manager was always there to help us. We really liked the beaches in Antipaxos and the great tavernas in Gaios village! We ll come back for sure! The residence is close to any possible desireof yours!